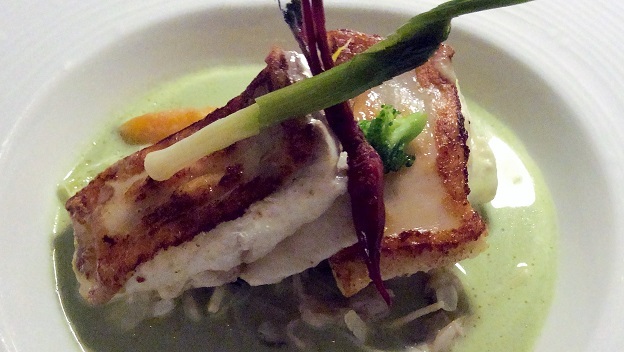 In the eyes of many observers, Torre del Saracino is the best restaurant in Italy. Owned by the likable and talented Gennaro Esposito, Torre del Saracino has become famous over the years for dishes like the parmigiana di pesce bandiera (a take on eggplant parmesan, but using local fish) and the zuppetta di ricotta di fuscella con le triglie (ricotta soup with red mullet), both modern-day Italian culinary classics. A first Michelin star arrived in 2001, followed by a second in 2008. Foodies in the know are left scratching their heads as to why a third star hasn’t yet graced this address given some of the ridiculous two and three stars awarded elsewhere in Italy. Gennaro Esposito started off in small local restaurants and went on to study with the likes of Gianfranco Vissani and Alain Ducasse (at the Louis XVI in Montecarlo as well as at the Plaza Athénée in Paris). And while his dishes effectively manage to blend Italian creativity and French rigor and precision, Esposito has also remained steadfastly loyal to the products of his native Campania and the Thyrrenean Sea. So you won’t find any Chilean sea bass, blueberries or little known Asian spices used here just for the sake of it, but rather local foodstuffs of the highest quality sourced from artisans who are at the top of their craft. By the way, readers who love bufala (buffalo) mozzarella should taste, at least once, the version offered here, which is cut in pieces right at the table from mozzarella braids of various kilos. For my taste, there are fewer, if any, better bufala mozzarellas anywhere in Italy. The restaurant is bright and airy, with white being the dominant color. An old tower (or torre, in Italian) is available for aperitifs or after dinner drinks, and it’s a great place to start or finish your evening. Most importantly for us wine lovers, the restaurant has a solid wine list, It doesn’t reach the size and bragging rights of places like Tour d’Argent in Paris or Enoteca Pinchiorri in Florence, but it’s thorough and competently composed. Best of all, wines are extremely fairly priced. Let me be clear: I don’t know about you, but personally, I have had it with high-end restaurants that charge €450 for a 2008 second or third growth Bordeaux or €120 for a Nero d’Avola from Sicily that’ll run you €20 in any wine shop. Good for Esposito and Torre del Saracino. On this visit, I started things off with an anchovy antipasto that might be a little too raw and fishy for some, but that was absolute nirvana for an anchovy lover such as myself. Two great Falanghina wines carried me through the antipasto and the pasta dishes in style: the lovely, dense 2012 La Sibilla Falanghina Cruna del Lago Campi Flegrei, and the fresher, slightly more penetrating and precise 2012 Contrada Salandra Falanghina Campi Flegrei. Italian wine lovers should note that, along with Mustilli’s Vigan Segreta, there are no better Falanghinas being made in Italy today. The three primi were each spectacular in their own way. The mixed pasta soup is an especially virtuoso performance, with as many as fifteen different pasta shapes cooked separately into a soup of rare delicacy and precision. It’s an example of how Esposito reworks old classics; the mixed pasta soup is a nod to the decades old habit of women in poorer Campanian households making the best they could with what little they had. Hence, odds and ends of different pastas were not thrown away but mixed together into one dish. Clearly though, without cooking each separately for the exact amount of time each requires, the final result would prove less than interesting. Another nod to local produce comes with the intelligent use of the silver scabbardfish, called pesce bandiera or pesce sciabola in Italy (Lepidotus caudatus) and extremely long, thin fish flattened on the sides (it can reach two meters in length or roughly seven feet, though it rarely exceeds three feet) typical of the Thyrrenean sea. It lives anywhere from 100 to 1000 meters below the surface, moving to more superficial waters in the summer months when it’s easier to catch. It is now a common ingredient in Campanian seafood recipes: it’s also a much more insightful restaurant choice than the plethora of generally tasteless farm-raised sea bass and turbot infesting seaside restaurants everywhere in Europe. 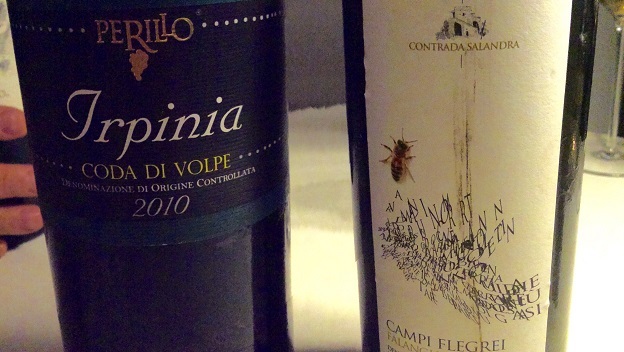 My next two wines were also from Campania: the 2012 Tenuta Sarno 1860 Fiano di Avellino, typically light and lemony, and the 2010 Perillo Coda di Volpe Irpinia, which showcases just how well wines made from this great but underrated Italian native grape can age. The Fiano matched especially well with the delicate Nocellara olive soup with fennel puree and silver scabbardfish (one of the best fish dishes I have had in some time), while the Coda di Volpe’s thicker texture and age derived tertiary aromas and flavors allowed it to pair effortlessly with the richer, fleshier dentix hamburger, garlic cream and watercress dish (almost as good as the previous Nocellara soup dish). All four white wines, made with Campanian native white grape varieties, were bright and crisp, offering pure, unadulterated (unoaked) versions of what the single grapes can deliver. They helped make a great meal even better, matching heavenly with Esposito’s delicate but flavorful fish preparations. At reasonable alcohol levels, they also allowed me to get up from the table with considerable spring in my step. I finished this marvelous dinner off with a light and airy soufflé that turned the spotlight (as it should be) on the Amalfi coast’s number one food product, the incredibly large and perfumed Amalfi sfusato lemon. Stepping out into the cool night seaside breeze, I found myself already planning another trip back to Torre del Saracino.